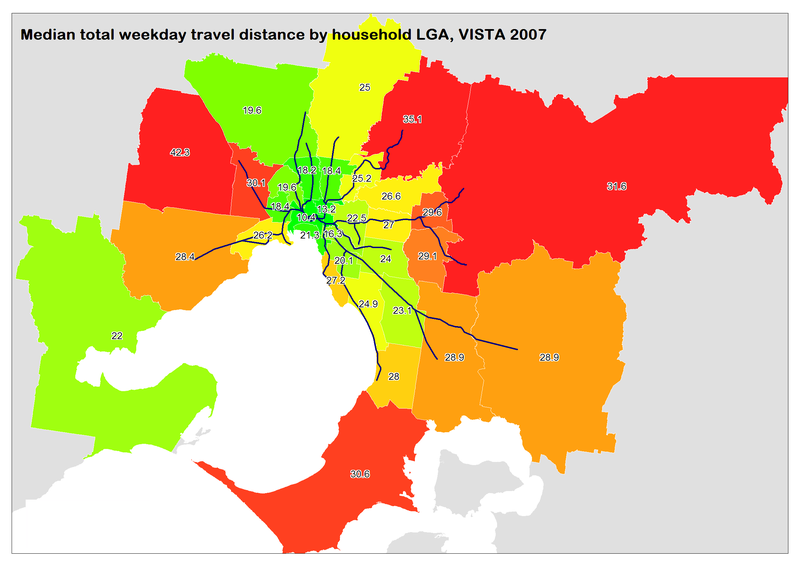 Thanks to the Department of Transport providing public access to VISTA (Victorian Integrated Survey of Travel and Activity) 2007-2008 travel data, it is fairly easy to plot some results geographically for Melbourne (I’m planning to plot some other patterns, but this is a first installment with some general patterns). 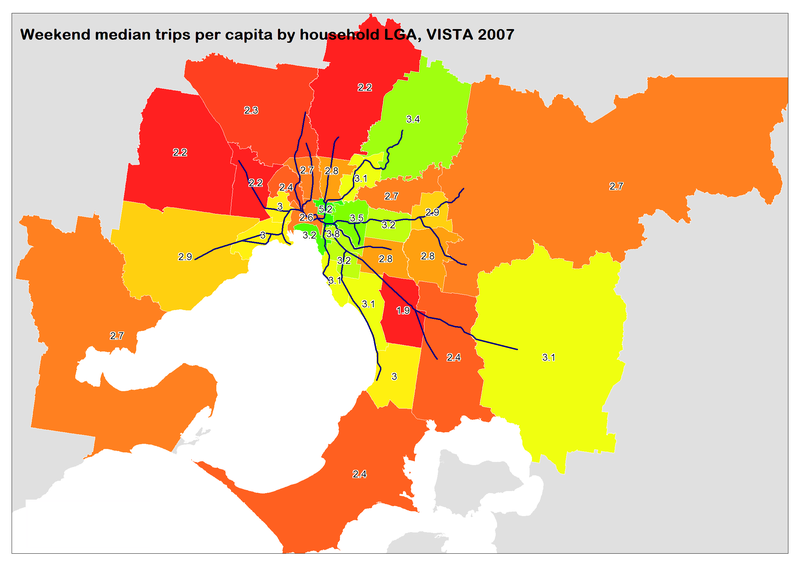 The gallery below contains maps showing mode shares and trip distances for each LGA (Local Government Area) in Melbourne. 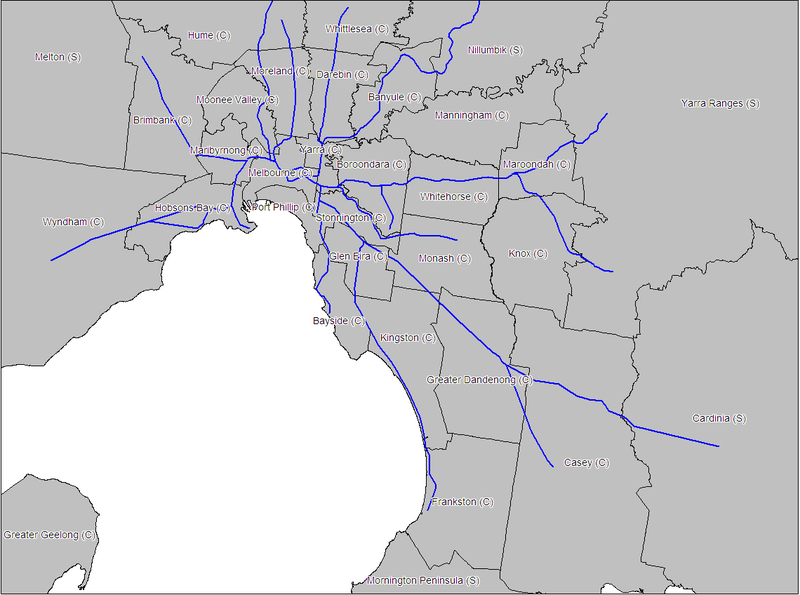 If you don’t know Melbourne’s LGAs by name, a reference map is included above (also showing train lines). All data is by LGA of residence, which is different to LGA of trip origin. Mode shares are for all trips, not just motorised trips. The colour scale for each map is different. I have a 14 colour scale (using “equal count” ranges) and I have deliberately not included a legend. So refer to the numbers for each LGA for relative values. Note the colour band jumps are not always ideal, do refer to the numbers as well as colours when comparing. 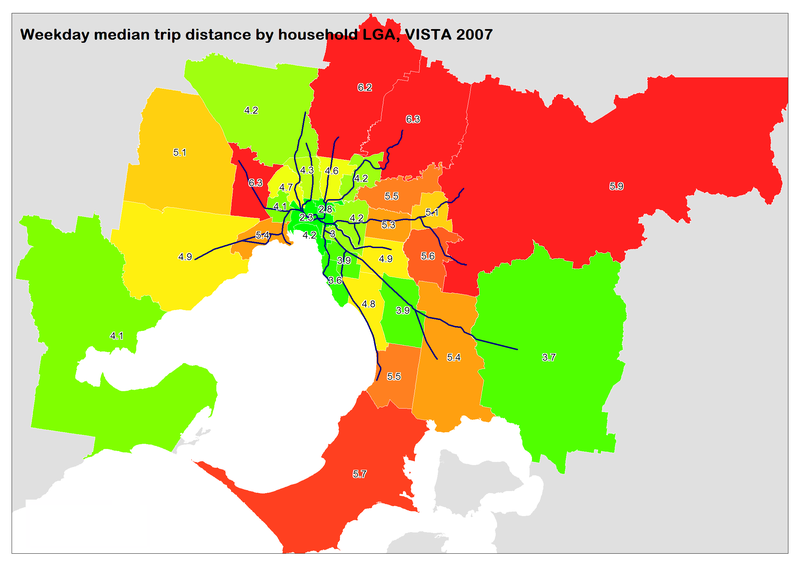 Average trip distances don’t actually vary a huge deal if you look at the numbers (except the inner city, Brimbank and the outer north-east) – probably because most trips are local trips. Longer median trip distances in the outer north-east might be due to a larger rural population (smaller urban areas in these LGAs). Trips per capita seem to be lowest in the growth interface councils. This might be related to more babies being present in these areas(?). 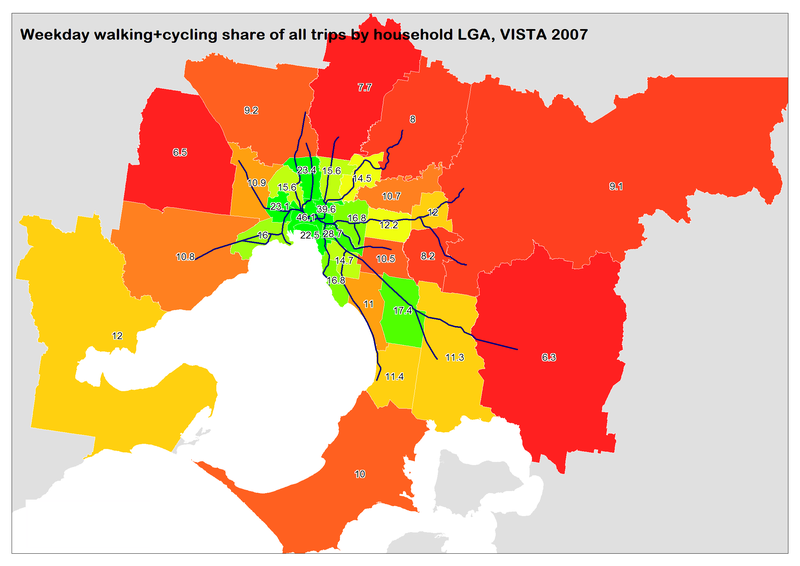 Walking and cycling rapidly declines with distance from the CBD, with Greater Dandenong something of an outlier. 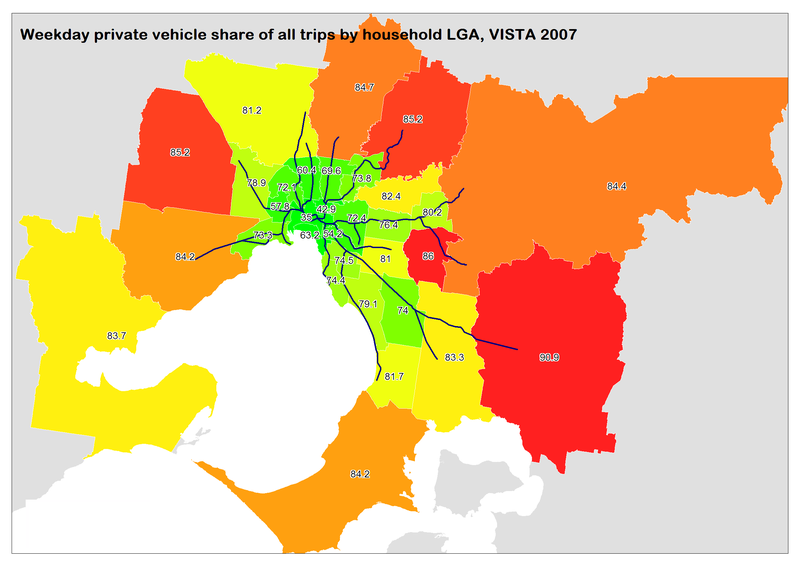 Private transport mode share tends to increase with distance from CBD, with Dandenong again something of an outlier (probably due to low socio-economic status). 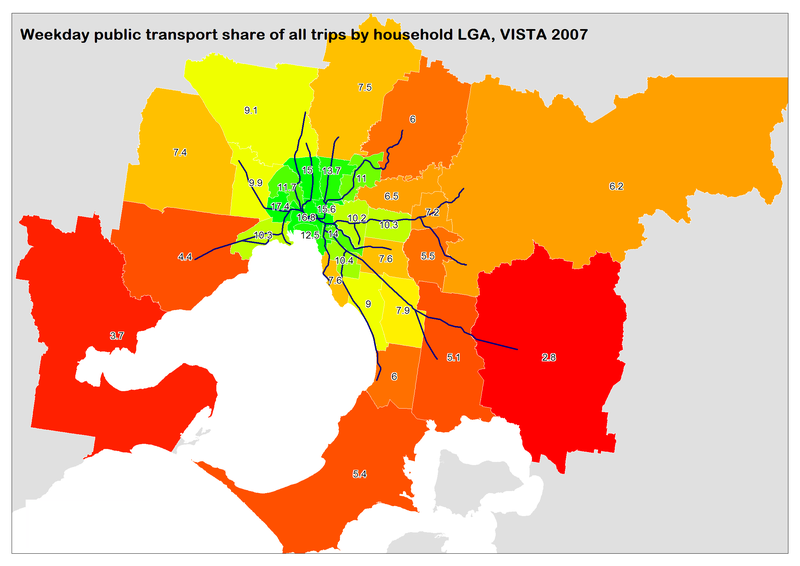 Public transport mode share is higher in the inner city and inner northern areas. Lowest in the outer south east and south west (Dandenong again perhaps a bit of a local outlier – even though many parts have relatively poor bus service levels). Of course there are lots of factors at play in all this (income, household types, demographics, PT supply, employment distribution, etc) and I’ve mostly speculated on some potential causes – certainly not attempted to explain all the causes in this post! VISTA is a very comprehensive household travel survey, and it includes over 17,000 households, almost 44,000 people who made over 145,000 trips – all in 12 months. The median trips per LGA is around 3500 – by around 1000 people (although some more than others – the smallest is Cardinia with 578 trips measured). So in most cases the sample sizes are very large, giving a small margin of error. 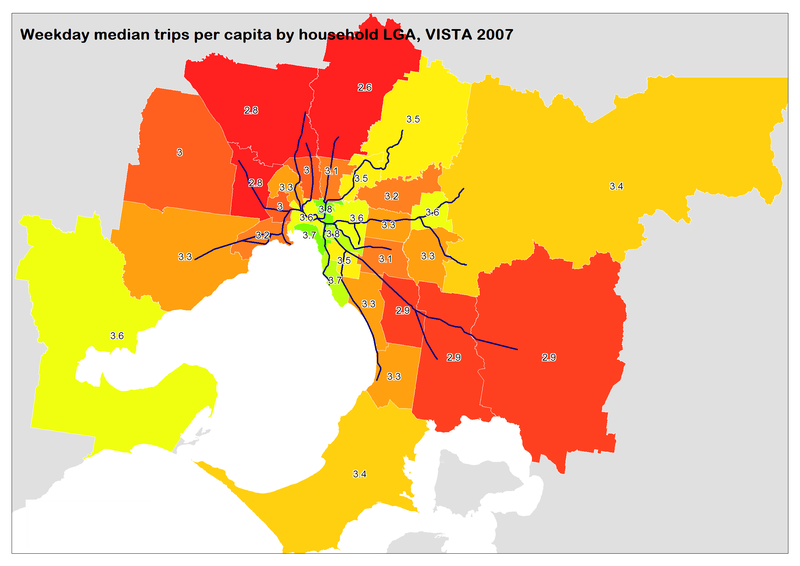 The data has been weighted to match the demographics of Melbourne in the 2006 census, which will control against under or over sampling of particular demographic groups. Travel distances aren’t perfect – straight line distances between points are scaled up to take account of indirect routes being used for all modes (except trains where exact distances are known). Household travel surveys are never perfect, but I think VISTA is a well developed and comprehensive survey and the outputs will be quite reliable as long as you are not disaggregating data into small segments. The weekend data in the maps above has the smallest sample sizes the (median sample of trips for the weekend is around 700 per LGA). This entry was posted on Sunday, January 17th, 2010 at 2:15 pm and is filed under Melbourne, Mode share. You can follow any responses to this entry through the RSS 2.0 feed. You can leave a response, or trackback from your own site.